Beef: Sirloin (New York), Rump, Rib Eye (Scotch Fillet), Fillet. Lamb: Trim Lamb Leg Steaks, Fillet, Eye of Loin, Cutlets and Diced Lamb. Pork: Butterfly Loin Steaks, Spare Ribs, Leg Steaks, Fillets, Diced Pork. Cooking items with thick bones, such as T-bone steaks, is not recommended. Tougher cuts such as beef blade, topside steak, lamb forequarter, or neck chops can be used. To tenderize these cuts, marinate them for a few hours or overnight in a marinade with wine or vinegar to help break down the connective tissue. If using a marinade recipe or pre-marinated meats from your meat retailer, drain excess marinade off and dab the meat with paper towels before placing on the grill. Some marinades contain high sugar levels which can scorch on the cooking plate. Do not salt meat before cooking. Salt will draw out the juices and toughen the meat. Do not pierce meat with a fork or cut meat while cooking. This will let the juices escape, resulting in a tougher, dry steak. Use tongs instead. Do not overcook meat. Some meats are better served pink and juicy. Parboiling sausages can alleviate the need to pierce sausages before cooking. When removing fish pieces from the grill, use a flat, heat-resistant plastic spatula to support the food. There is an art to determining when your steak, lamb chop or cutlet is cooked to the correct degree of doneness –- rare, medium rare, medium, medium well, or well done –- but it is easily mastered with these handy hints and tips. Cook for a few minutes per side, depending on thickness. Turn once only. Cook until steak feels very soft with back of tongs. A meat thermometer will show the internal temperature of a rare steak as 130-140°F (55-60°C). Cook on one side until moisture is just visible on top surface. Turn once only. Cook on the other side until surface moisture is visible. Steak will be cooked to medium rare when it feels soft with back of tongs. A meat thermometer will show the internal temperature of a medium rare steak as 140-150°F (60-65°C). Cook on one side until moisture is pooling on top surface. Turn once only. Cook on second side until moisture is visible. Steak will be cooked to medium when it feels springy with back of tongs. A meat thermometer will show the internal temperature of a medium steak as 150-160°F (65-70°C). Cook on one side until moisture is pooling on top surface. Turn and cook on second side until moisture is pooling on top. Reduce heat slightly and continue to cook until steak feels firm with back of tongs. A meat thermometer will show the internal temperature of a medium well steak as 160-170°F (70-75°C). Cook on one side until moisture is pooling on top surface. Turn and cook on second side until moisture is pooling on top. Reduce heat slightly and continue to cook until steak feels very firm with back of tongs. A meat thermometer will show the internal temperature of a well done steak as 170°F (75°C). The grill is ideal for toasting most types of bread (white, wholemeal, kibbled wheat, wholegrain etc. ), as well as artisan breads (Focaccia, Turkish bread, baguettes, bread rolls, etc.) Raisin bread, brioche or other sweet breads which contain high sugar content will tend to brown more quickly. Try to use canned or pre-cooked fruit as fresh fruit may release excessive juices when heated. Be careful when biting into sandwiches containing fillings such as cheese and tomato or jam as they retain heat and can burn if eaten too quickly. 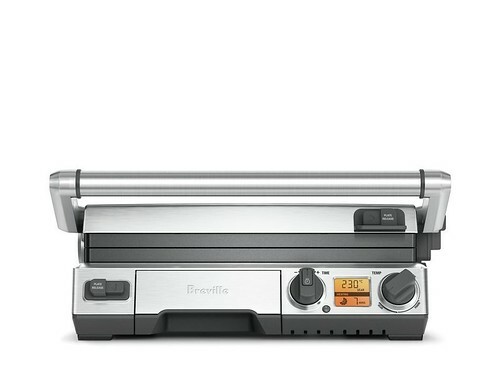 The flat plate makes the grill ideal for toasting plain breads and Turkish bread, without any fillings or spreads. Try toasting Turkish bread with jam for a great alternative to standard breads at breakfast. Due to the non-stick flat plate, it is not necessary to use any butter or margarine on the outside of your toasted snacks.